All four members of the Runfurther committee were out on Saturday running in the Tour de Helvellyn. 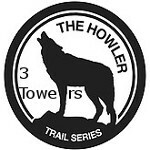 This is one of Joe Faulkner’s Nav4 races, and a great event. We talked to Joe about the possibility of including one of his races in the 2016 Championship, which would be great if we can do it. By the way, if anyone wants to write up any ultra races, we’re happy to host your accounts here, or post a pointer to your blog site. They don’t have to be Runfurther races. A bit about the race first. This was the 5th year of this race, and Joe tries to fix it as close to the shortest day as he can. Within limits, you start when you want to, and everyone tries to run as little of in the dark as they can: faster runners can finish in daylight, but slower runners can’t. It’s a true winter Lake District mountain race, and it goes ahead whatever the weather, provided it’s physically possible to get to the start and get marshals to the checkpoints. The first year the going was difficult due to a lot of icy stretches, particularly the tracks, where flooded sections had frozed solid. The second year was the year of the snow, when I had my microspikes on for both the main passes, and drifts on the way up to Sticks Pass were feet deep in places. 2013 saw gales, and runners wading through floods in Patterdale. I think 2012 was relatively benign, and conditions this year were pretty good too. It was wet underfoot, and there was a bit of wind, but the wind was against us on the way out, which meant it was behind us when we were knackered on the way back. The temperature was just about ideal – cool but not too cold – and visibility was good too. What rain there was didn’t do enough to get us wet. So where is this race? It starts from Askham, a pretty little village south of Penrith, east of the Lake District. From there it follows a bridleway WSW over the moors of Askham Fell and slants down almost to the shores of Ullswater at Howtown. A slight climb takes you to Martindale Hause, between Hallin Fell and Steel Knotts, where there’s a checkpoint by the old church. A short quiet road section takes you to the roadhead in Bannerdale, then a bridleway climbs up to Boredale Hause (399m), getting steeper and stonier as you climb. The descent to Patterdale is quick and easy, with Checkpoint 2 at Side Farm, near the campsite. Take the road to Glenridding and up the valley to the youth hostel and the old mines, then a steep zigzag climb gets you out of the valley and up to the next checkpoint by a footbridge in the middle of the old mine workings. I was a bit surprised by this, as the last time I’d been there snow covered everything, and I’d seen no signs of the mines that high up. Steady climbing up a good path leads to the crest of the Helvellyn ridge at Sticks Pass: at 749 metres this is the highest point of the race. The descent from here is mainly a good runnable path, down to Legburthwaite at the north end of Thirlmere, and the next checkpoint. 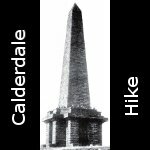 Normally, the route now follows a path southwards across the slopes of Whiteside, then a path through forestry to Dunmail Raise. This year the path was temporarily closed, so we had to run along the minor road along the west side of Thirlmere instead, which nobody seemed to find much fun, despite the views. A quick stop at a checkpoint, then up to Dunmail Raise, a place to awaken memories in anyone who’s run the Joss Naylor Challenge or the Bob Graham. Thankfully you don’t have to turn right and flog up to Steel Fell. Instead it’s turn left up the steep stony path alongside Raise Beck to a pass at 574 metres, then a traverse above Grisedale Tarn to join the stony tourist path down Grisedale to Patterdale. From there you retrace your route over Boredale Hause and Askham Fell to finish at Askham, and many runners have gone astray in the dark on the final stretch, as the paths here are confusing, and landmarks few. 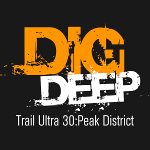 38 miles and about 8000 feet of climbing: this is a great mountan challenge, with quite a bit of difficult steep and stony ground – one of the great races, in my view. Karen Nash’s account of the day can be found here, with photos. Nick Ham’s photos are here, and the full results are here. How did I get on? Well it started on Friday really, when I tripped on my own front path and hurt my foot: in fact I’m pretty sure I broke a toe. It doesn’t look pretty, and doesn’t feel too good either, but I thought I’d probably still be able to run. I set my alarm for 4:30am, and the less said about how I felt when it went off the better. I drove to Askham in the rain and arrived in the dark just before 7, but at least the rain had stopped by this time. After registering and greeting friends I queued for the kitcheck and start, thinking it’d take me at least 2 hours to get to the Side Farm checkpoint, which doesn’t open until 9:30. I set off at 7:30, with just enough light to see my feet, but not enough to read the map. Perfect timing, I thought, but no. I actually ran a lot faster than I was expecting, and by the time I got to Boredale Hause I was clearly going to arrive in Patterdale too early. I eased off on the throttle, but still got there 10 minutes early, and had to hang around with loads of other runners who’d underestimated their abilities. So, at 9:30 the race started again, and for a few seconds I was the leader on the course. It was all going suspiciously well really, as I seemed to be going well, and felt I could keep it up all day. The climb up out of Glenridding was hard going, but then I’m never very fast going uphill. Stronger runners were cutting off the zigzags, but I know my place. I got to the top of Sticks Pass knackered but only temporarily, and after a few minutes I was moving pretty well down towards Thirlmere. At which point a blur streaked past me that turned out to be Ian Symington who was later to finish fourth. The road round Thirlmere was horrible, but I kept running, and even passed 2 or 3 runners, not something I’m used to doing on roads. A few passed me on the steep climb up to Grisedale Tarn, but I got into gear on the way down again. It’s a steep and stony track needing concentration to keep upright, and by working hard at it I managed to pass some of those who’d overtaken me on the climb. At Side Farm I took a couple of Ibuprofen, as my back was hurting on the uphill sections. This isn’t something I do often, but I’d been going so well I didn’t want to get stopped by anything now. The climb up to Boredale Hause went well, considering its steepness, then I really surprised myself by motoring fast for the rest of the way. Normally I’d expect to be struggling by this time, and going a lot slower. I felt good and kept running and overtaking all the way to Askham – I was even lucky in having someone to follow on the last tricky navigation section. I breezed into the finish in 37th place with a time of 8:06:04, including the 10 minutes waiting at Side Farm. First MV60 by 90 minutes, 6th MV50, and a pb by 85 minutes. Probably my best run for a couple of years, and I’ve really no idea why. Next I had to do a presentation. Ian Symington was first man in this year’s Runfurther Championship, and he, John Minta and Kevin Hoult had also won the team competition for Calder Valley Fell Runners. None of them had been able to make the Runfurther prizegiving, so we’d arranged to do the presentation after the TdH. Ian was already there of course, and John finished shortly after me. I then went out to my car to get changed and bring the trophy and prizes in. Taking my running tights off I discovered a small hole in my shin that appeared to go right down to the bone, which I’d no idea had happened, although I had tripped a couple of times on the way round. Going back in, I asked Joe Faulkner for a dressing for the wound, and he got out a variety of first aid equipment and patched me up. Then I did the presentation to Ian and John, fairly incompetently as I was so knackered, and Karen attempted to take photos with my steamed up camera (where were you Nick?). I then drove home and disintegrated in a heap on the settee. So, here I sit with a broken toe (probably), a hole in my shin, and a newly acquired cold in the head, but with a big grin on my face. It’s days like that that make running such a joy. A truly great challenging race, in good running conditions, with a great collection of other runners, and running my socks off for a change. What can beat it? Roll on the Hardmoors 30! There are a load of great photos of the event here.